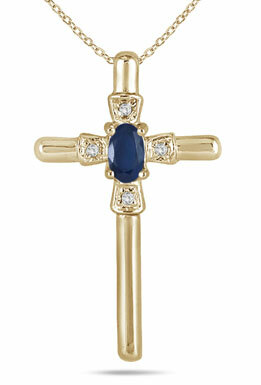 This Oval-Cut Sapphire and Diamond Cross Pendant in 10K Yellow Gold is a true treasure to wear as its blue sapphire gemstone sparkles from its mount on the gold cross. The combination of blue sapphire, white diamonds and yellow gold makes for a stunning necklace that can be worn each day as a reminder of one's faith. The cross is cast in 10K yellow gold and accented with rounded edges. At the center of the piece, where the two arms of the cross meet, the shape widens to highlight a unique gold setting for each of the round-cut white diamonds ( 0.02 t.c.w.) featured in the pendant. The blue sapphire (5 x 3 mm, 0.25 ct.) dazzles the eye as the true center of the cross, reflecting beautiful rays of blue light. The cross is attached to the gold chain by way of a hidden mount at the top of the pendant. We guarantee our Oval-Cut Sapphire and Diamond Cross Pendant in 10K Yellow Gold to be high quality, authentic jewelry, as described above.